This is how well they know the "grown ups" they are trying to convince to sign up. It looks like they are calling them children. Vermont is going to implement it in 2017 and they are looking at a new 19% payroll tax to pay for it. 11% on the employer and 8% on the employee. And they may need an additional consumption tax on top of that. middle class Americans will not pay one more dime in taxes except when we force Obamacare on you. Obama keeps forgetting that "except" part. That sounds about right depending on what percentage of their population is in the work force. Health care is 16% or so of our GDP and it is going to take that amount to pay for it. On the other hand, we are already spending that so it may be more a matter of restructuring costs than funding a new program. I don't think it would be a highly popular proposal. If instead of 11% employer tax and 8% employee tax, they asked the people whether they would prefer 5% plus 5% and very effective death panels, I bet Vermonters would say to Granny, "So long, it's been good to know ya." Any economist will affirm that these kind of tax splits are a sham and legal fiction. No matter how you write up the bookkeeping, the money ends up coming out of the employee's pocket. Although both employees and employers pay FICA taxes, most economists believe that the employer’s share is fully offset by reduced wages and thus the entire economic burden of the tax ultimately falls on workers. The reason for this is that the employer only cares whether it cost to keep you in his employ. He does not care whether the money goes to you, or to the social security admin. He decides what you are worth to him, and that's what he will pay. If more money has to go to the gov't, less money is going to go to you. This is basic econ 101. We tack on all these mandated employment taxes on the employer (SS, Medicare, FUTA). Plus mandates like FMLA that effectively increase the cost to the employer of keeping people on staff. Then we wonder why wage growth has stagnated so much....duh....the raise you didn't get was sent by your employer to Washington DC. The "sticker shock" that many buyers of new, ACA-compliant health plans have experienced—with premiums 30% higher, or more, than their previous coverage—has only begun. The costs borne by individuals will be even more obvious next year as more people start having to pay higher deductibles and copays. If, as many predict, too few healthy young people sign up for insurance that is overpriced in order to subsidize older, sicker people, the insurance market will unravel in a "death spiral" of ever-higher premiums and fewer signups. The "I can't keep my doctor" shock will also hit more and more people in coming months. Next year, millions must choose among unfamiliar physicians and hospitals, or paying more for preferred providers who are not part of their insurance network. More IT failures are likely. People looking for health plans on ObamaCare exchanges may be able to fill out their applications with more ease. But the far more complex back-office side of the website—where the information in their application is checked against government databases to determine the premium subsidies and prices they will be charged, and where the applications are forwarded to insurance companies—is still under construction. The next shock will come when the scores of millions outside the individual market—people who are covered by employers, in union plans, or on Medicare and Medicaid—experience the downsides of ObamaCare. Next, the Congressional Budget Office's estimated 25% expansion of Medicaid under ObamaCare will exert pressure on state Medicaid spending (although the pressure will be delayed for a few years by federal subsidies). The "Cadillac tax" on health plans to help pay for ObamaCare starts four years from this Jan. 1. On the supply side, medicine will become a far less attractive career for talented young people. More doctors will restrict practice or retire early rather than accept lower incomes and work conditions they did not anticipate. The people still have control of where this goes - through pressure on politicians, through elections, ... This is going to be bad news for many people. 14 States set up their own exchange - so far, 4 of the Directors of those State Exchanges have "resigned". Hawaii, Maryland, Oregon and now Minnesota. The director of Minnesota’s health insurance exchange, April Todd-Malmlov, abruptly resigned this week, making the exchange the fourth state program to see a leadership change in the midst of mounting criticism over the rollout of President Obama’s new health care law. On the UP side - States are holding these people accountable. On the DOWN side - The Obama Administration doesn't hold anyone accountable for their screw-ups, at least nobody in their administration is held accountable - Obama does find plenty of people outside of his Team to point the finger of blame toward. Oh my.... How can this be? "California's Obamacare insurance exchange enrolled more than 53,000 people in health-care plans in just the first three days of this week, a blistering pace that had officials crowing on Thursday. "December is turning out to be an enormous month," said Peter Lee, head of the Covered California exchange. Lee said the surprisingly strong level of enrollments—which comes just days before the key Dec. 23 enrollment deadline—puts the state on track to beat its original projection of signing up as many as 700,000 people in Obamacare insurance by the end of open enrollment in March." I bet they are all old and sick! Let the picture do the talking. Looks to me like they're poor. Be thankful only 1/2 the states took the expanded medicaid. Look what company stands the benefit the most from expanded medicaid. Why it's the very company Liz Fowler came from to go work with Baucus on writing the bill. And 1.5 million have signed up for medicaid as of 12/3. They will far surpass the 700K of paying subscribers by the time March 2014 rolls around. Several large insurance companies stand to benefit from the Medicaid expansion fostered by Obamacare. WellPoint, Inc. (NYSE:WLP), in particular, appeared poised to reap financial gains from increased Medicaid enrollment. The company boasts the highest current Medicaid enrollment, with 4.3 million members — around 12% of WellPoint’s total enrollment. That has nothing to do with my post that you quote. 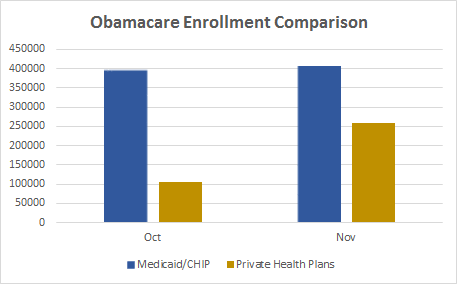 My post is about Obamacare, not Medical, enrollments surging during December and putting CA on a trajectory to exceed expectations by March (too early to tell I will admit).